Xiaomi Mi A2 and Mi A2 Lite are set to launch come July 24.
before this day the phones can be found on two e-commerce sites in Romania, revealing nearly everything. The Xiaomi Mi A2 runs Android 8.1 Oreo. 5.99-inch full-HD+ display with an 18:9 aspect ratio. Qualcomm Snapdragon 660 SoC, paired with 4GB of RAM. 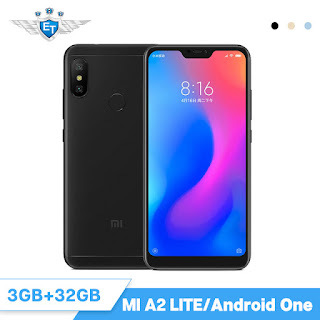 Xiaomi Mi A2 comes with a dual rear camera 12-megapixel primary sensor and a 20-megapixel secondary sensor – both featuring an f/1.75 aperture, along with an LED flash module. On the front, it could have a 20-megapixel sensor with artificial intelligence (AI) backed features, including an AI Portrait mode. 4G LTE, Wi-Fi 802.11ac, Bluetooth v5.0, GPS/ A-GPS, USB Type-C, and a 3.5mm headphone jack on the connectivity front and a 3010mAh battery. while the Xiaomi Mi A2 Lite is expected to sport a 5.84-inch full-HD+ display with a 19:9 aspect ratio. 3GB RAM option and up to 64GB of onboard storage that is expandable via microSD card (up to 256GB). The smartphone is also found to have a 12-megapixel primary sensor and a 5-megapixel secondary sensor within its dual rear camera setup and a 5-megapixel front camera sensor. Besides, it could come with a 4000mAh battery and offer connectivity options such as 4G LTE, Wi-Fi 802.11ac, Bluetooth v4.2, GPS/ A-GPS, and Micro-USB. more specifications as the company unveils these smartphones comes July 24th.